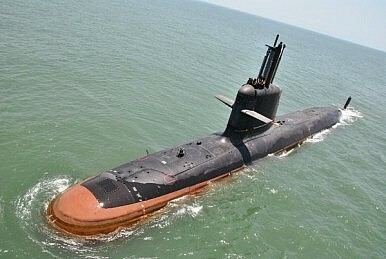 Can India Counter China’s Submarine Force? Is the Indian Navy ready for the challenges posed by increased Chinese activity in the Indian Ocean? Last week, India’s first conventional submarine in over a decade and a half —the INS Kalvari—finally began sea trials, amid reports of Indo-U.S. cooperation in tracking Chinese submarine activity in the region. As sightings of Chinese submarines become more frequent in the Indian Ocean region, the Indian Navy is looking at innovative ways to gain an edge in anti-submarine warfare (ASW) capabilities. Can the Indian Navy effectively counter a modern Chinese submarine force, which is primarily optimized for regional anti-surface warfare missions near major sea lines of communication in the Indian Ocean? India’s expenditure on defense acquisition has remained largely static in real terms in recent years, resulting in constraints on not just the navy but the armed forces in general. The defense outlay for fiscal year 2016/17 was INR 2.49 trillion (USD 36.63 billion), but according to IHS Jane’s 360, this was counterbalanced by rising inflation, and weakening of the Indian rupee against the U.S. dollar over the past two years. Furthermore, the force posture and modernization agendas of the Indian armed forces under the continued broad influence of a “two-front war” construct have left the Indian Navy with a mere 16 percent of the defense budget (excluding defense pensions). This limits the navy’s capacity to address increasing diffusion of the People’s Liberation Army-Navy (PLAN)’s capabilities in the region. The commissioning of the INS Kalvari, first of six indigenously-built French Scorpene-class submarines, should be a shot in the arm for the navy’s ageing and dwindling submarine fleet. However, the submarine will be inducted sans its primary weapon: torpedoes. The navy plans to buy Black Shark torpedoes from a subsidiary of Italian defense big wig Finmeccanica. But the company is currently embroiled in a helicopter bribery scam in India that will create further delays in acquisition, leaving the weapons platforms ineffective for the near future. Given how long submarine building takes, the follow-on program for Project-75 I submarines is probably more than a decade away, considering the Ministry of Defence is yet to issue a Request for Proposal. The navy’s most-recently inducted surface combatants destroyers—INS Kolkata, INS Kochi, and ASW corvettes INS Kamorta and INS Kadmatt— lacked Active Electronic Towed Array Sonar (ATAS) systems to detect submarines at the time of commissioning. The Indian Navy is also woefully short of ASW helicopters, which means that ships have taken to sailing without their requisite air complements of late. The purchase of 16 Sikorsky S-70B naval multi-role helicopters (MRH) is stuck in price negotiations. While the navy has made significant progress in acquiring government approval to build a robust warship program, its acquisition of an adequate multi-role ship-borne helicopter has been futile. This significantly reduces the ability of Indian vessels to triangulate and engage underwater targets. However, in recent years, India’s aerial maritime surveillance has received somewhat of a boost with the induction of eight Boeing Poseidon-8I maritime patrol and ASW aircraft, which have been deployed to the strategically important Andaman and Nicobar Islands and more recently, Seychelles. The process of acquiring four more P-8I aircraft is on. In contrast, according to a new Congressional Research Service report, “China since the mid-1990s has acquired 12 Russian-made Kilo-class non-nuclear-powered attack submarines and put into service at least four new classes of indigenously-built submarines.” The same report quotes various defense sources, estimating the PLAN submarine force to grow to between 69 and 78 submarines by 2020. A combination of nuclear-powered (such as Jin class/Type 094) and conventionally-powered (such as Yuan class/Type 039A) submarines will represent formidable capability. Compounding Indian concerns over China’s increasing underwater ambition in the Indian Ocean, Pakistan is believed to be in the process of purchasing eight Type 039A/Type 041 Yuan-class diesel-electric submarines from Beijing. Added to the existing three French Agosta-90B/Khalid and two Agosta-70 submarines of the Pakistan Navy, the Indian Navy faces a significant under water threat in the years to come. Prominent strategic analyst Ashley Tellis recently argued that India’s “current and prospective defense budget constraints” suggest that it won’t be able to fund its stated warfighting orientations “adequately,” and this will constrain its ability to be a net security provider in the region. Acquiring “effective military capabilities for power projection coupled with wise policies for their use” are key to India’s ambitions in the region. Fitting India’s defense needs within a reasonably-sized budget remains a challenge as concerns remain over its fiscal situation. Despite allocating around 54 percent of its budget (INR 394.25 billion/USD 5.93 billion, excluding pensions) to capital expenditure this year, the navy would be woefully short of funding its Long-Term Integrated Perspective Plan (LTIPP 2012-27). This is because the assumption was that the allocation for defense would equal 3 percent of the Gross Domestic Product (GDP) during the entire plan period, which has not happened. Cooperating with the United States and regional partners in ASW in the Indian Ocean will help the navy bridge its ASW capacity deficit, and also allow for the optimization of its available assets and capabilities. The commitment to sign the Logistics Exchange Memorandum of Agreement (LEMOA) during U.S. Secretary of Defense Ashton Carter’s visit to India last month— which grants India access to certain U.S. military bases like Diego Garcia, Djibouti, Bahrain as well as logistical assets in the region— will be central to Indo-U.S. cooperation in ASW. With a bit of imagination, the Indian naval assets can increase their endurance, and range in tracking and deterring PLAN’s submarine forays into the region. Division of labour, by way of forming different areas of responsibility to track and monitor, will help focus India’s limited ASW capacities in strategically-vital regions. While procurement difficulties and funding issues will drive New Delhi’s cooperative sourcing of maritime capabilities, India’s defense preparedness and capability-development efforts will ultimately depend on building an efficient system of defense procurement, indigenous production capability, and acquisition reform, in order to sustain this modernization. Given the centrality of the Indian Ocean to India’s national security and China’s increasing activity and ambition there, New Delhi must recapitalize and optimize its ASW capability in order to shape the region’s security environment. Pushan Das is Research Assistant at Observer Research Foundation, New Delhi. A version of this piece originally appeared at South Asian Voices, an online platform for strategic analysis and debate hosted by the Stimson Center. Two Poseidon 8I aircraft have recently been dispatched to the strategically-located Andaman and Nicobar archipelago.